I’ve had a bad craving for a sandwich on Dutch Crunch bread ever since I received the Bouchon Bakery book for my birthday. Thomas Keller (not the only chef I read, but seemingly the only chef I talk about) just released the beautiful tome dedicated to all things baking last month and it’s a truly stellar collection with step-by-step photos to guide the baking newbies (myself included). 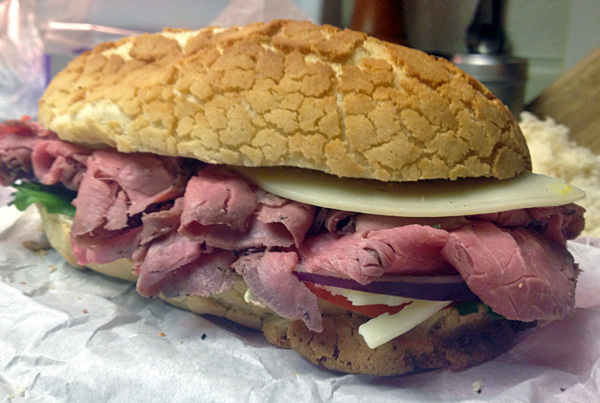 His recipe for roast beef on Dutch Crunch caught my eye, and I’m not much of a bread baker … YET. But I must have caught the world in a Dutch Crunch deficit, because the bread was super hard for me to find. I looked in OC, and even in NorCal when I was up there last week. Couldn’t find it here, and up there one place was seriously sold out. I found some finally at Zonotto’s in San Jose. I bought a small loaf, brought it in my luggage … and finally, SANDWICH BLISS. I split the bread with the wife to cut the calories in half and dressed it up as best I could while keeping calories in mind: 3 oz. each of angus roast beef (sliced at the deli counter), 1 slice provolone cheese, 1/3 roma tomato, mixed greens, thin-sliced red onions, a smear of yellow mustard on the top and the bottom and a dash of salt and pepper to finish. Each half was 370 calories. You can cut another 50 calories per side by using half a slice of cheese instead of a full one. And even if you don’t like red onion, don’t skip it here. The acidic bite it provides works well with the mustard and accentuates the flavor of the lean beef.